How UV Lamps, Bulbs Work; Low/Medium Pressure, Coatings . UV (UVC) Lamps (Bulbs) used in Aquariums and Ponds and how they work. 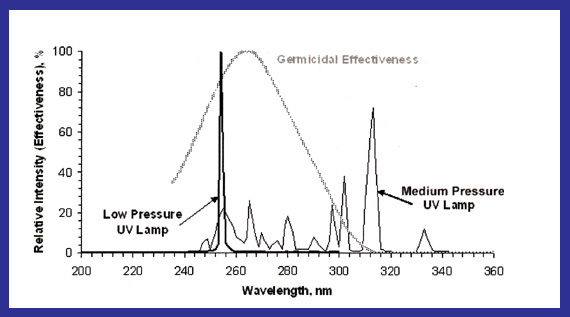 This post is primarily dealing with UV bulbs(or lamps), that emit UVC radiation. These UV lamps to be referenced here are used in the Aquarium/Pond Industry. I will discuss other UV bulb types as well, since these may someday show up in the Aquarium/pond Industry. 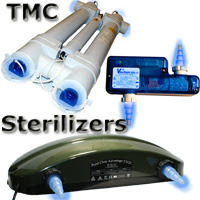 There are two common UVC emitting lamps types currently employed for pond or aquarium UV Sterilization: the low pressure and the medium pressure mercury lamp. *The low pressure lamp emits its radiant energy between 250-260 NM which is where UV Sterilization is most effective with a UVC efficiency of about 38- 95%. The emission peak of the Mercury electron transition within these low pressure (hot cathode) UV lamps is fixed in both energy and wavelength. *The medium pressure lamp emits its radiant energy between 250 and 350 with many energy spikes in between (most notably around 320 which is more in the UVB range) with a UVC efficiency around 7-15%. CAUTION: Many Medium-Pressure UV bulb/lamp manufacturers incorrectly boast that the broad UV spectral output of these lamps is more effective, which in reality is the exact opposite!! The low pressure lamp used by most all Premium Aquarium & Pond UV Sterilizers (not always the low end UVs such as Jebo & AquaTop) is clearly the better choice based on this information. The low pressure lamp does have one flaw which the medium pressure lamp does not suffer from and that is the low pressure lamp is affected by water (or air) temperatures and operates best between 20 C (68 F) and 40 C (104 F). Generally this is not a major concern considering most aquarists operate their aquariums well within this range. With ponds, this is still not a major concern in that most problems, including algae occur in warmer months. This problem can be also addressed with in-line heaters to pre-warm the water. Many UV Sterilizers come with quartz sleeves which form an air pocket between the lamps and water that in theory increases operating temperatures. HOWEVER my own tests have shown this improvement to be nominal at best especially when compared to a well designed direct contact UV Sterilizer. In a test with a custom 15 Watt UV Sterilizer and a 13 Watt Quartz sleeve UV Sterilizer (a well designed one at that), the increase in temperate was only 2 degrees F (I have observed up to 5 degrees depending on the units compared). This test started at 68 F and was conducted over 15 minutes, then water was removed from the units and the temperature measured. Unfortunately the quartz sleeve is accepted as a standard that sounds great in theory, but in practicality is not a significant improvement in most applications (I would recommend them in some applications such as Lobster tanks, but even here a pre-heater would also be recommended). A few companies now provide a coating that they claim extend lamp output and lamp life. I have serious doubts to these claims based on the fact the emission peak of the Mercury electron transition is fixed in both energy and wavelength and I don't think coatings can emit additional UV to any advantage. Coatings usually capture UV and convert the emission wavelength via further energy transitions to some visible part of the spectrum, perhaps with several spectral peaks depending upon the composition of the coating. One such company, Emperor Aquatics, makes the claim that their UV Lamps feature an internal chemical coating that provides added resistance to solarization. This company uses a picture of a new bulb/lamp with the coating and a one without. HOWEVER I in my 30 + years have never witnessed the degradation shown in this picture, and I suspect that Emperor Aquatics is using an Ozone producing UV bulb/lamp to make their point. Another aspect of UV lamps that should be noted is how they function or start. Most quality UV lamps commonly used are Hot Cathode (low pressure) UV lamps. The Hot Cathode Germicidal UV Lamps are similar in their operation to the standard fluorescent lamps. The Hot Cathode lamp operates from a ballast or transformer and requires a device such as the glow switch starter to preheat the electrodes in order to start the lamp. The electrodes, located at the ends of the lamp, are tungsten filaments coated with emission material and, under normal operation, govern the life of the lamp. In view of the fact that the life of the electrodes is shortened by frequent starts, the lamp life is rated according to the number of times the lamp is started. Operation at low temperatures may result in excessive lamp blackening and rapid depreciation in ultraviolet 'C' output. UV Lights have many other great uses also. I think they need to be discussed. Ultra violet light, such as that found in a UV light air purifier, can kill toxic substances in your home, greatly reducing allergens, killing germs and enhancing your family’s health. Visit for more information related to UV Lights Air Care UV.